Review — If you want your holiday to start within moments of landing, then Sheraton Maldives Full Moon Resort & Spa is your ideal choice. The resort offers something for everyone, from ocean and water villas, to affordable entry level beach-front deluxe rooms, an extensive selection of watersport activities, a dive center, four restaurants and three bars, ranging from beach BBQ to fine dining. 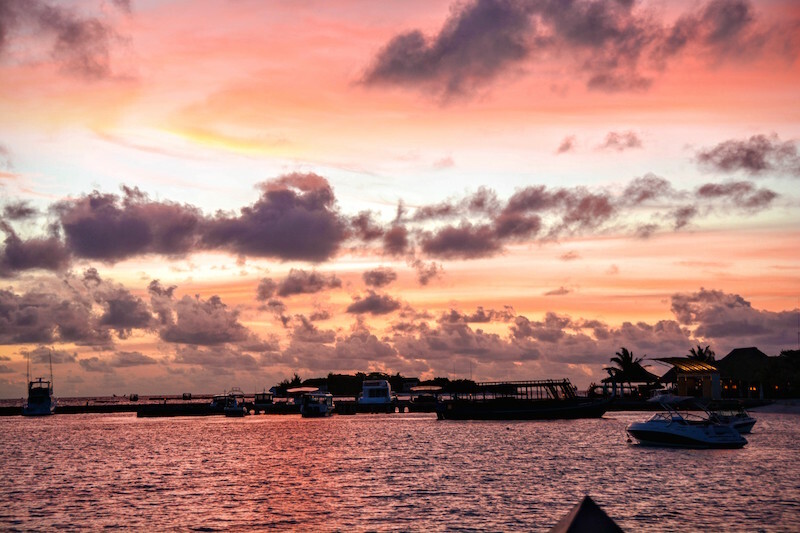 It’s a short 10 minute speedboat ride from the airport to Furanafushi Island in the North Malé Atoll, but it feels a world away from it all. 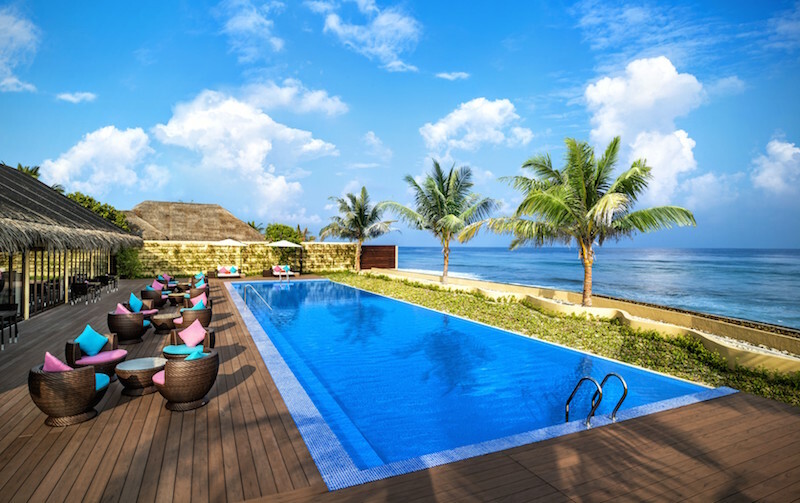 The proximity to the airport makes Sheraton Maldives Full Moon Resort & Spa a convenient destination for visitors arriving from short-haul destinations, such as Dubai or Singapore, looking for a long-weekend, says the resort’s Senior Marketing Communications Manager Shumaes Rasheed. Jetsetters familiar with the Sheraton brand will feel right at home at the members-only Sheraton Club Lounge on the surf side of the island. The large up-scale, glass-fronted lounge, overlooks a massive deck and 144 square meter pool, which beckons you to swim a few laps, before tucking into the complimentary breakfast buffet or the evening canapés during the daily pre-dinner cocktail hour. On our first day, we forgo the highly recommended sunset shark feeding spectacle at Anchorage Bar, for the spectacle of dark storm clouds rolling in and out over the choppy ocean. We watch from our bed-sized beach lounge at the Sheraton Club Lounge, whilst sipping French champagne and feel as if we are the only guests in the resort. You wouldn’t know that the resort is running at full capacity during our stay and if you opt for an Ocean Villa, the highest room category at Sheraton Maldives Full Moon Resort & Spa, on the same secluded side as the Club Lounge, you could indeed spend your entire stay without meeting another soul. 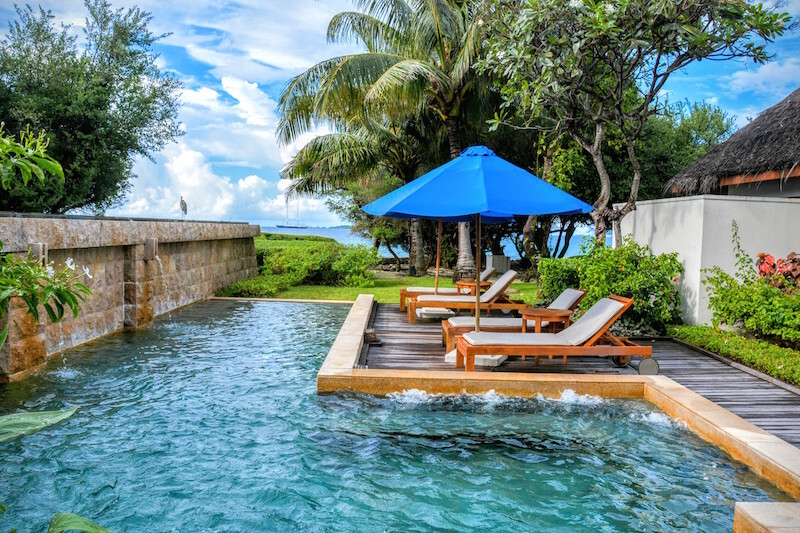 There is no direct beach access from the Ocean Pool Villas, which ensures total seclusion and makes this room category popular with honeymooners and couples who value complete privacy. In-villa dining never looked more appealing. 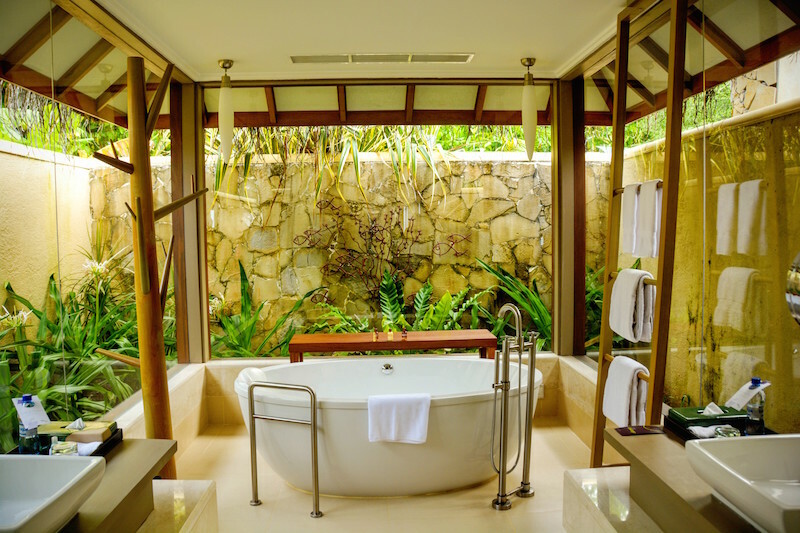 The stunning outdoor bathroom in itself will keep you from stepping beyond your villa. It’s enclosed by floor-to-ceiling glass panels, which keep the insects out and the cool air in, whilst you enjoy a bath in the large, freestanding tub. 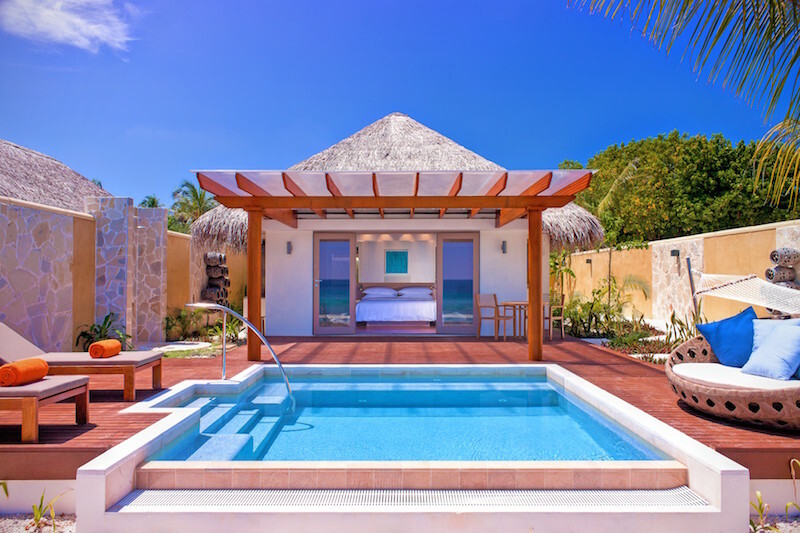 The spacious villas have everything you’ll need during your stay, including a state-of-the-art coffee machine, a private deck with uninterrupted ocean views and a plunge pool. But if you do decide to venture beyond your Ocean Villa, you don’t have to go far to find another oasis of seclusion and relaxation. 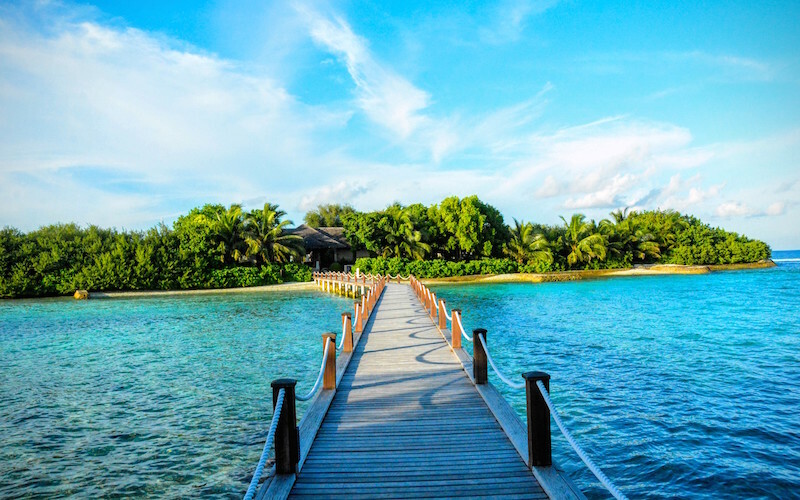 Shine Spa sits on its own island and is reached via a wooden boardwalk. 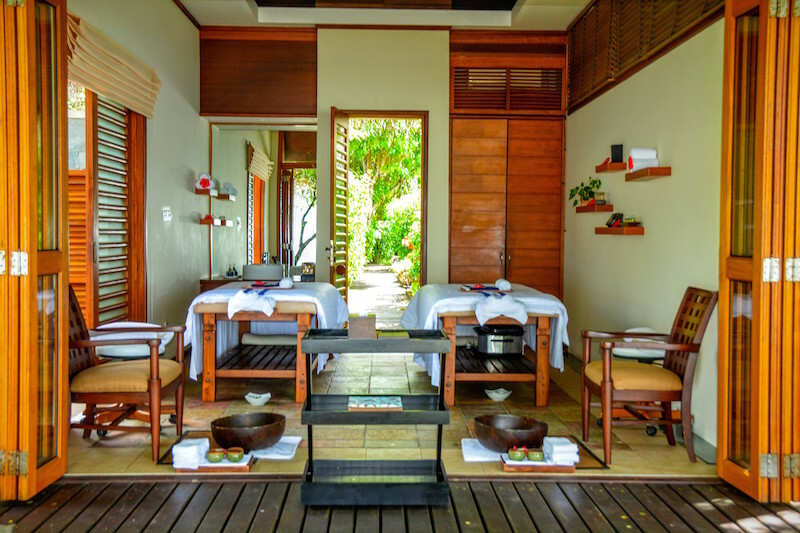 It has beautiful ocean-facing double treatment rooms and His-and-Hers change rooms, each with its own outdoor pool. Come early and ease into the spa experience by taking a steam bath, followed by a soak in the hydrotherapy pool. 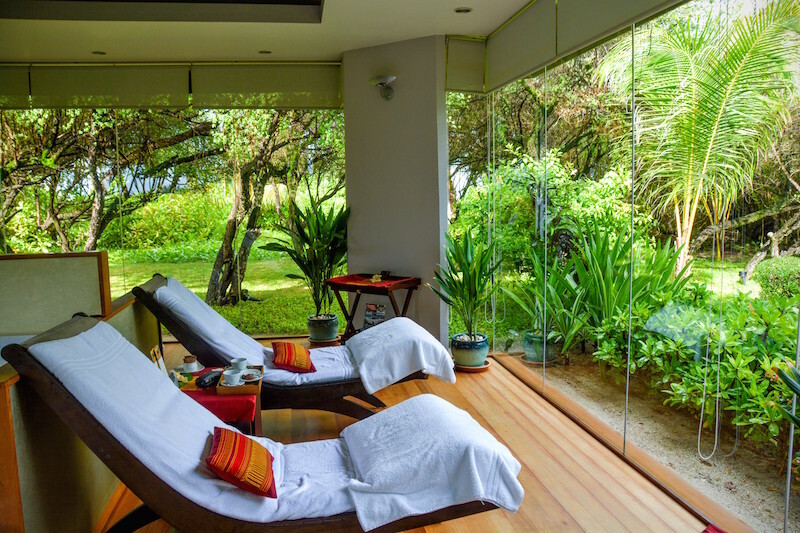 After your signature treatment to the sound of the surf breaking on the shore and the scent of frangipani petals, reserve time for some serious deep chilling on recliners in the glass-enclosed relaxation room, enveloped by emerald jungle. You’ll be so blissed out, you’ll risk missing the rest of the resort. And that’s the thing about Sheraton Maldives Full Moon Resort & Spa; no two experiences will be the same on this small island. You can be as active or as chilled out as you like to be. 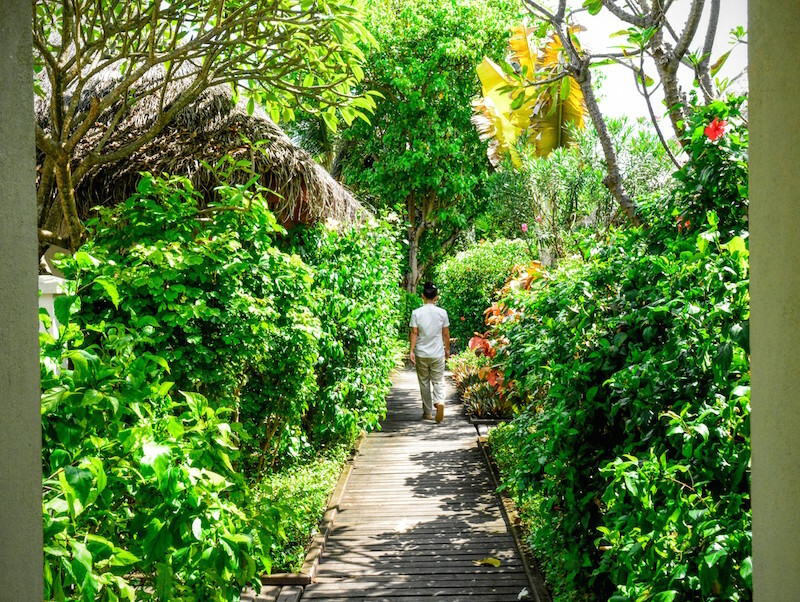 Walking back to our Island Cottage, the afternoon air is alive with the sounds of wind rustling in palm fronds and the spreading wings of flying foxes, making their way across the canopy of giant banyan trees. From the deck of our cottage, we watch a pair of heron birds flirting across the thatched rooftops of the cottages. The spacious, freestanding Beachfront and Island Cottages, each with outdoor bathroom and deck, are clustered around the Malé-facing shallow lagoon. Island Cottages are slightly set back, but the beach is hardly far from anywhere on this small island, which makes the cottages popular with families. In the late afternoon the turquoise lagoon is a hive of watersport activity. The wind has picked up and we pass a hands-on demonstration of our sailing skills, before we are allowed to take the catamaran beyond the barriers of the lagoon, where speedboats and public ferries cross. It feels like transitioning from a sandpit onto a busy highway and I scream into the wind as we pick up speed and go about several times. We return to the lagoon with knotted hair and sunglasses encrusted with sea spray after only half an hour on the water. I am grateful for the shelter of the lagoon, where I try out the kayak and manage to balance on the Stand Up Paddle Board to the clapping of a group of guests who were less successful. There is just enough time to wash off the salt and change before the sunset shark feeding session, from the over-water deck at Anchorage Bar. 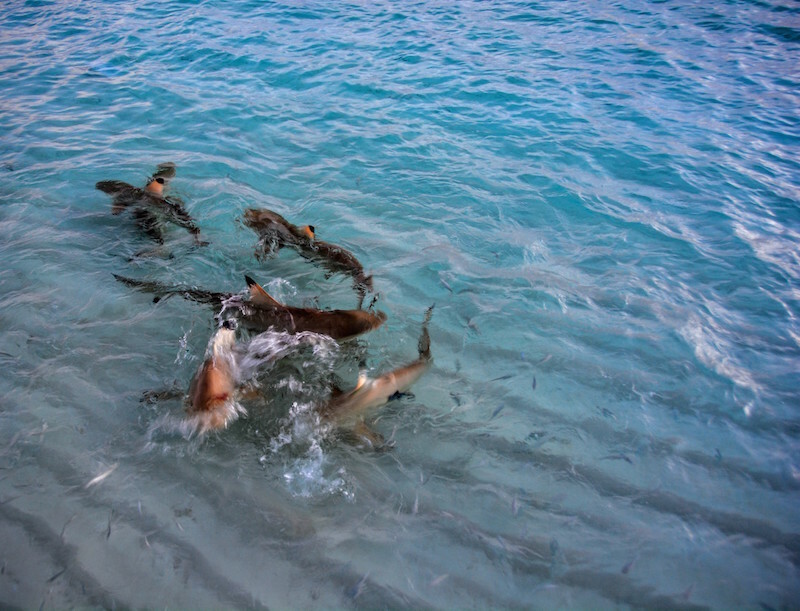 It takes a moment for the sharks to show up for their daily appointment, but suddenly the water turns into a writhing knot of eight black tip reef sharks and two baby sharks, fighting for bits of raw fish. It’s a fantastic spectacle that draws quite a crowd. Then it’s time for our own dinner. 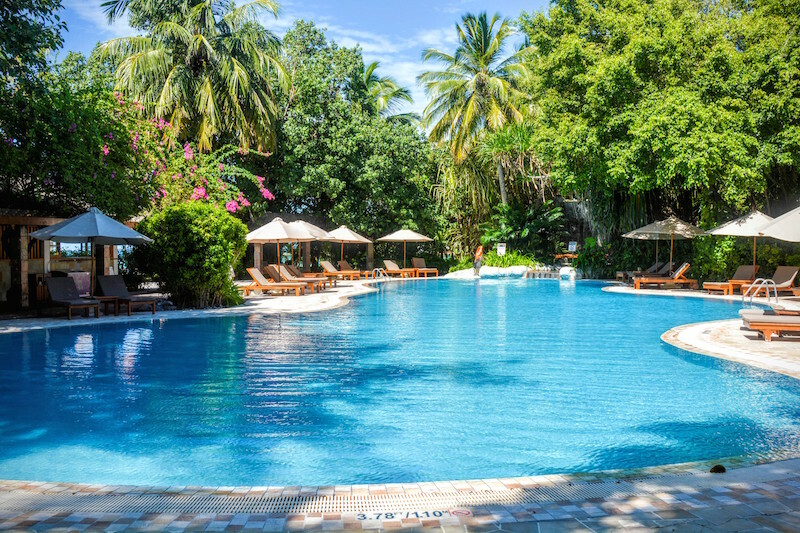 The restaurants at Sheraton Maldives Full Moon Resort & Spa are arranged around a large pool set amidst beautifully landscaped gardens. We sample fine Thai food at Baan Thai restaurant on our first night; on our last, we choose a live reef fish and a mudcrab from the large seafood fish tank at Salt Restaurant, where we sit by candlelight at the edge of the lagoon in the soft evening breeze. After dinner we have a nightcap at Anchorage Bar to the live music of local band Limestone and the twinkling lights of Malé and Hulumalé, almost within touching distance, and yet so far away. Kerstin Pilz was a guest of Sheraton Maldives Full Moon Resort & Spa. Sheraton Maldives Full Moon Resort & Spa welcomes you to a world of golden sunshine, fine dining, water sports and entertainment, whether you seek relaxation or adrenaline.